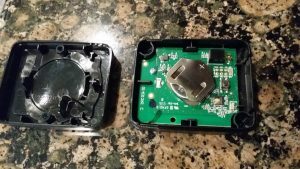 Changing the Battery in your Smart Garage Door Sensor is Easy. If you receive a “Garage Door Malfunction” message from your DFW Security app, you probably just need to change the battery in your smart garage door sensor. Follow these easy instructions to quickly change the battery and get it working again. 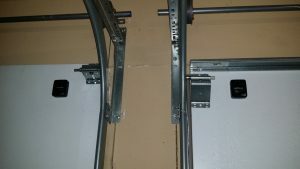 First be aware that there are 2 types of garage door sensors – one that only shows whether your overhead garage door is open or closed, and one that actually opens or closes it. 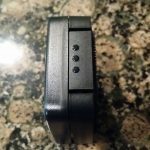 If you are normally able to open and close your garage door remotely using our app, then you have a smart garage door sensor and this is the article for you. Locate the sensor. It is usually attached with Velcro or double-sided tape to the upper corner of your garage door, inside the garage. If Velcro is used, pull the sensor off the door for easy access. Take off the cover. The two halves separate rather easily. Remove the old battery by sliding it out of its holder. You may need to use a narrow object like a flat head screwdriver or paperclip to push it out from the back side. If you haven’t already purchased a new battery, you can take this one with you to the store to make it easier to locate. 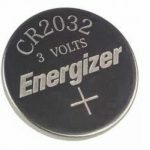 The battery needed is a 3V disc –shape called “CR2032”. They can be found at many retailers like Walmart or Home Depot, and even in most grocery stores, usually by the hearing aid batteries. Slide the new battery into place. The shiny side with the + and CR2032 should be facing up. Put the 2 halves back together until they click. Re-mount the sensor to the garage door in the same location you removed it from. Everything should work now, but in some cases you may have to log out and then back in to your app before the changes take effect. If you are still having problems, contact the DFW Security service department at (877) 372-0350. We are happy to help!